Several pod review videos have been uploaded to my YouTube channel over the past month. I'm also taking some time to explain my lack of food challenges (quantity and/or spicy) lately. Since summer and fall are the prime seasons for growing chiles, a few chile growers have graciously sent me pods. I chose to cover those peppers on my channel so that they get an additional plug for their business. 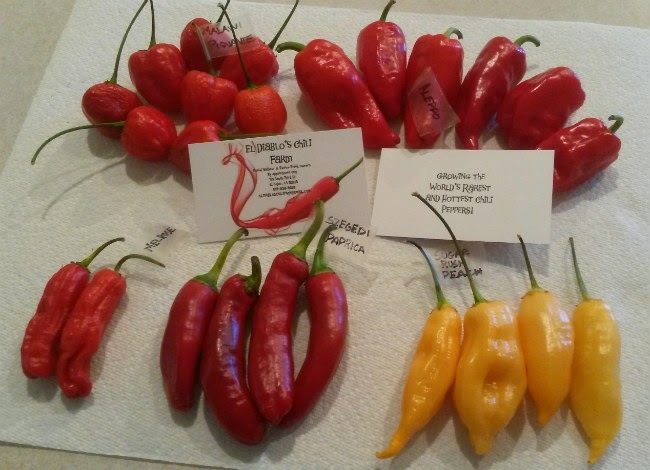 I've finally gotten through the pods that Daniel Wallace sent me from El Diablo's Chili Farm. All non-superhots, each with good flavor. Jason Reilly ("Chile Beast") is a fellow spicy food warrior, with an insane spice tolerance. He also grows various chiles in Hawaii and was awesome to share a few. This all but confirms that Hawaii has a nice climate for growing peppers. The Red Brazilian Ghost Pepper he sent burned. The Urfa Biber thankfully showed mercy upon my insides. And Jim Duffy, your pod reviews are coming up next. Stay tuned, my chilehead brother! In the meantime, I've reviewed a few snacks. Popcorn, Voodoo chips, and pomegranate salsa. The Panda's Bar has remained open. Care for a Smoked Porter with Chipotle Peppers? My friend Emily wanted a Green Chile Pancake -- made in a rice cooker. For science. Finally, I will address my lack of food challenges lately. First of all, this is not my day job. While I do put nearly every last ounce of my free time into this stuff, I have other pressing matters going on from 9 to 5 on the weekdays. The life I lead has truly sucked the hell out of any social life I could have had. Second, I never have been, and never will be, a competitive eater of any type. I'm sure I have lost quite a few subscribers as a result, thinking I'm some type of wannabe spicy competitive eater who has faded into retirement. I cannot eat 20+ pounds of food like Matt Stonie, Joey Chestnut, or Takeru Kobayashi. Hell, I can't even eat five pounds of food. I'm also not like Randy Santel, who has won nearly 200 food challenges in the U.S. and Europe. So what am I? I am a foodie who travels for food. This is why my I named my blog and YouTube channel "Aaron's Food Adventures" -- and not "Aaron the Stupid Spice Guy." This is why I recently traveled to New Mexico and ate everything in sight there. No food challenges. Just a few days going up and down I-25 (mostly tackling Albuquerque). This is why I have planned a return trip to Canada. Lots of poutine and local beer await my stomach. And hopefully another meetup with Latechow. People have complained that I don't eat superhots anymore because they see all these non-superhot pods. First of all, I have reviewed superhots this year. Second, several chile growers have been gravitating more and more towards growing the non-superhots. Frankly, after reviewing all of Jim Duffy's peppers (reviews coming soon), I can see why. Even I prefer flavor over heat. I'm a foodie at heart. It's no secret that Ted Barrus, Chile Beast, and others want me to eat Steven McLaurin's Chocolate Bhutlah. I've commented on a few YouTube videos and Facebook posts addressing this. I know the lethal nature of that pod and will not back down. The ball is simply in Steven's court. If he wants to send me one, I will do a video on it and suffer for YouTube. For the loyal fans who have stuck around, I will keep doing occasional "challenges" that likely will involve stupidity, fast food/some other gluttonous item, or a combination of both. Spice will be involved. Others have also inquired about whether I would do a Q&A video. I may do one after passing 10,000 YouTube subs. Bottom line: I do food blog posts and YouTube videos because it's fun and I have the time to do them. The moment it stops being fun, I'm either taking a sabbatical or stopping altogether.